The taste and health benefits of onions have been appreciated for all of recorded history, and today onions are found in virtually every cuisine throughout the world. There are many varieties, and they play many roles--from primary ingredient to condiment to seasoning. 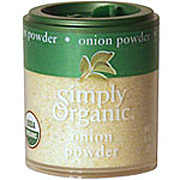 Simply Organic White Onion Powder is shipped in a discrete, unmarked package. Orders are processed immediately and usually take about 3 to 5 working days to be received. We do ask that you try it for 2 to 3 weeks to feel the full effects. Any information received is used only for order processing and shipping purposes. Your information, such as e-mail address, will never be disclosed to a third party.